A symbol of remembrance and a reminder of strength. The Baltic Way Memorial and Museum stands tall among the other towers of Riga as a symbol of remembrance for one of history’s largest non-violent protests and the profound result it had on Lithuania, Estonia, and Latvia. Much like a torch, the tower presents itself to Riga and the Baltic States as a beacon of strength, community, and resilience. 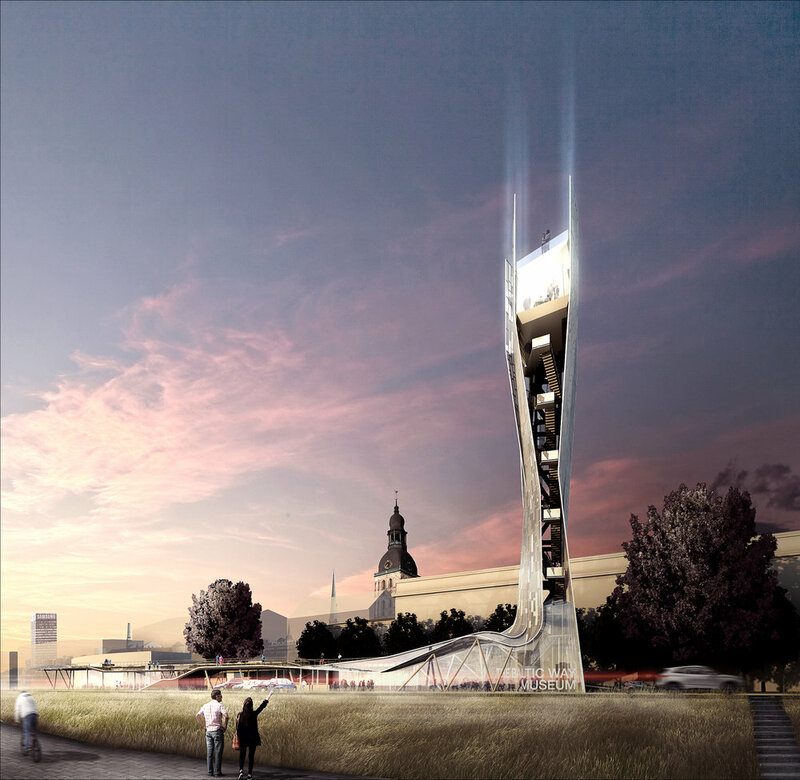 The memorial is conceptualized as a tower emerging from a lifted, public terrace. The terrace, a meer 3.5m high, is a place for observation, gathering, performance and public demonstration. Below, a café, museum shop, and the entrance to a memorable climb which terminates in a small gallery 53 meters in the air. This climb begins at the base of the tower, where three panelized ‘strands’ begin to ripple, revealing their fragility as they open to the sky, flooding the lobby with natural light. As one rises in the tower, the panels become increasingly transparent, revealing the city below. The gallery, a 40m2 glass enclosure, held and protected by six strands, hides its identity during the day but shines bright in the evening – acting as a kind of lighthouse to Riga. The six strands, three on each side, that support the tower evoke an idea about multiple hands grasping together to hold up a great people. Perceived from either side as three strands, they are designed to act as singular armatures that come together for a great cause – a cause that can only be achieved with combined effort. These three strands are in a way, representative of Latvia, Lithuania, and Estonia. The terrace, which rises from multiple points across the site is designed to be a public space. It is lifted, allowing the museum and café program to be nestled underneath. The terrace is designed to promote pedestrian connectivity between the Museum of the Occupation of Latvia and the waterfront. The terrace is lifted at the most westerly end to allow for increased views to the river. The stairs on the north side of the terrace create a small place of gathering for performances, shaded by the existing tree. As part of the overall plan, two new crosswalks are to be installed to assist pedestrians crossing the street. Given Russia’s recent military and political campaigns, the people of Latvia and the Baltic States need an urban symbol to remind them of what happened 25 years ago. This symbol is not meant to instill fear, rather it is designed to remind the Latvian people that their strength, discipline, and non-violent demonstration has prevailed in cultivating their home. This is a symbol of unity and identity.